Prepare yourself for the hammer. No not that hammer. This one. The Malleidae, or the hammer oysters, is a suite of around 30 species, primarily in the genus Malleus, all with a hammer or T shape to the shell. I mean look at this shell. I like to think in the evolution process a conversation like this occurred. Representative of all other clams, oysters, and scallops: So I thought we all a voted on this…and umm…agreed that our shells would be sort of roundish. Malleus: You know I got to drop the Hammer! Representative: Well you know is just that we kind of agreed on this. We really all need to be roundish. Malleus: You can’t stop the Hammer! Representative: What about a nice kind of tear drop shape? Malleus: Can you feel the Hammer! Representative: We could give you some cool wings or tabs? Representative: What about you some flashy spikes? Representative: Now your just being unreasonable. Malleus: HAMMER! HAMMER! HAMMER! HAMMER! HAMMER! HAMMER! Representative: Why are you shouting? Malleus: HAMMER! HAMMER! HAMMER! HAMMER! HAMMER! HAMMER! HAMMER! HAMMER! So why the hammer shell? Does Malleus crawl around and drop the hammer pain on unexpecting prey or predators? Do the shelled wings allow allow for some other bad-assery? The function of the hammer shell is perhaps a little more vanilla. Hammer oysters typically inhabit the course sands around coral reefs. Those wings, buried in the sand, serve as anchor, allowing the hammer oyster to stay in place as currents threaten to cary the oyster away. Share the post "Bring the hammer." 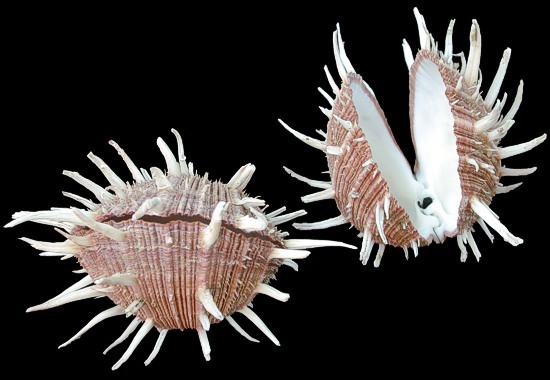 Five Mind-Blowing Bivalve GIFs That Will Blow Your Mind – Your Blown Mind Won’t Believe #6! Can Bivalves Kick It? Yes they can!